KooKoo gave a new and modern design to the famous cuckoo clock: clear, simple, pure. The cuckoo shows up every hour at Bird House and it shouts one time, or several times according to the hour. The bird house opens every hour and a colourful bird with the original voice of a native singing bird sounds. There are 12 further bird voices to be selected, from the blackbird to the oriole, recorded in nature. A total of 3 bird-voice modes can be chosen: a different bird sings at every full hour, or also the cuckoo or a selected bird. Birds have to rest at night; the light sensor ensures a peaceful night. 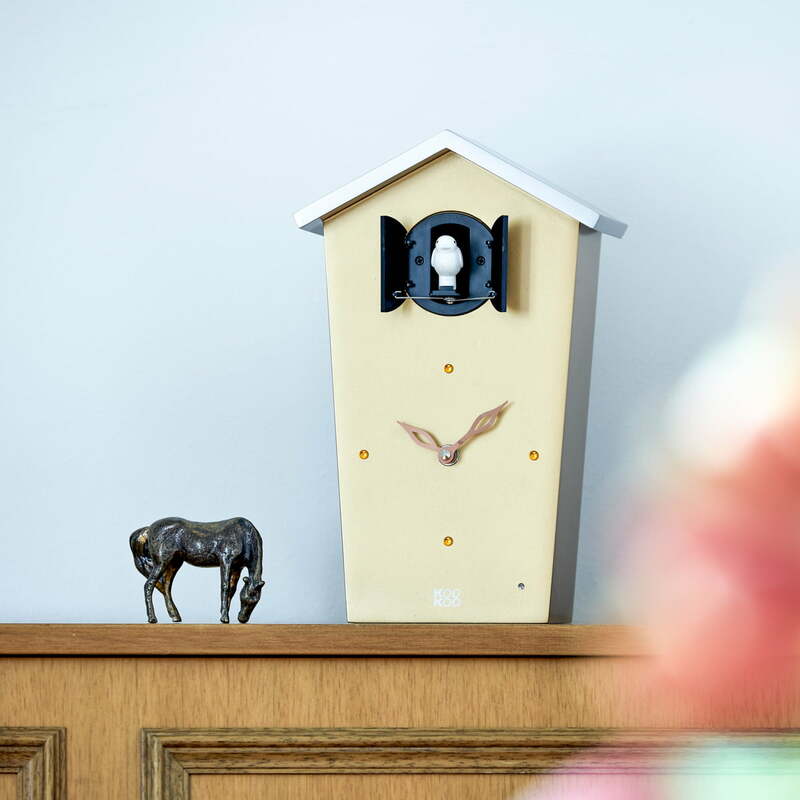 The Bird House Cuckoo Clock by KooKoo comes with 4 colourful birds and 4 colourful dials to exchange. 100 of 197 customers have found this review helpful. This item arrived with the speaker loose, and with the wires disconected. The cuckoo bird motor makes a very loud noise when opening and closing the cuckoo door. Sorry, but i didn't liked the quality of this item versus the cost. Thank you. Best regards. Single image of the Bird House Cuckoo Clock in black with red bird and blue pendulum by KooKoo. Thanks to the light sensor, the bird house and the voices switch off at less than 10 Lux. 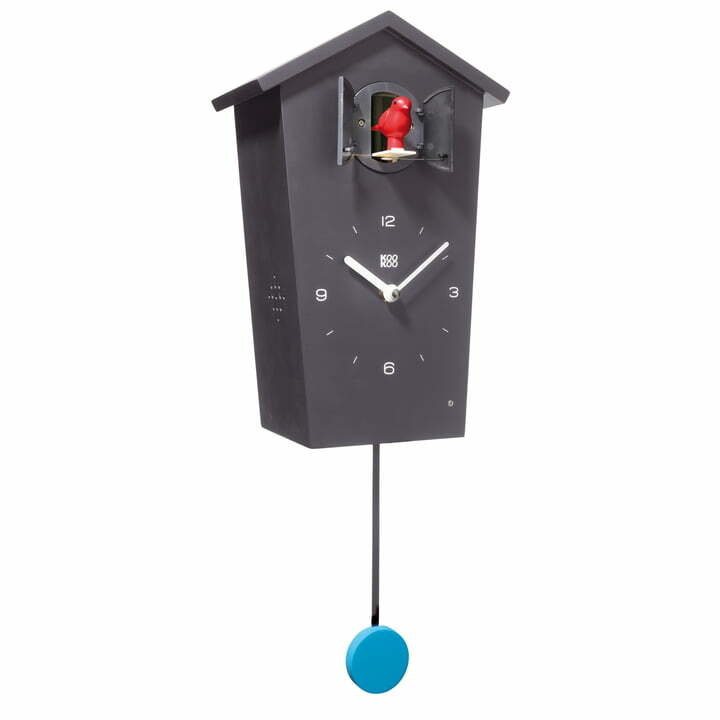 Single image of the Bird House Cuckoo Clock in weiß with blue bird and white pendulum by KooKoo. The bird house opens every hour and a colourful bird with the original voice of a native singing bird sounds. There are 12 further bird voices available. 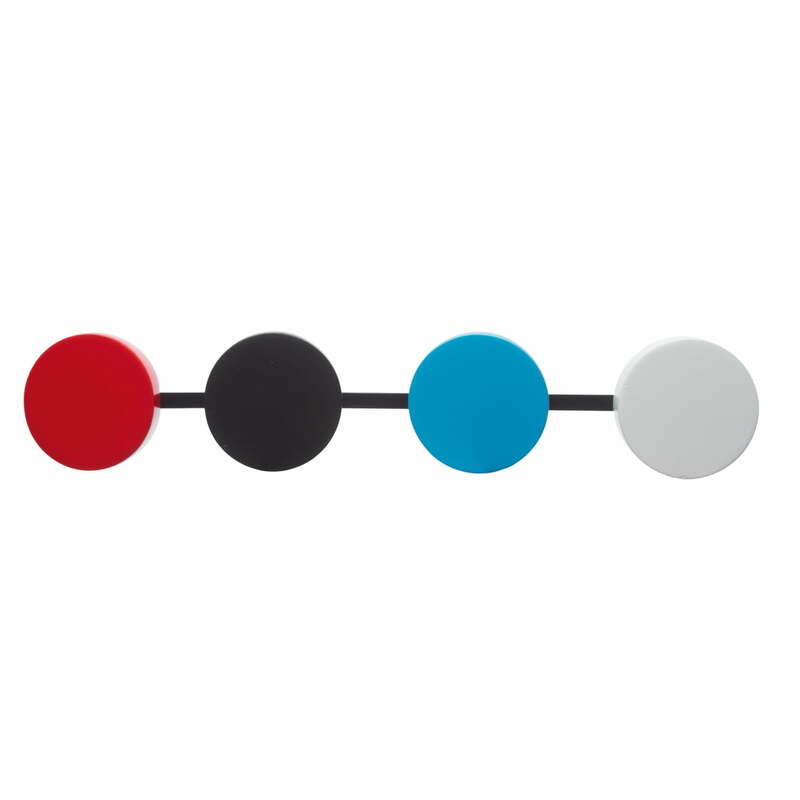 Image of the pendulums of the Bird House Cuckoo Clock by KooKoo in the colours red, black, blue and white. For exchanging matters, the 4 colourful pendulums are included in the delivery. Lateral single image of the Bird House Cuckoo Clock birds in red, green, blue and white. 4 colourful birds and 4 colourful pendant plates to exchange are included in the delivery package. Isolated product image of the KooKoo - Bird House Cuckoo Clock. The limited edition of the Bird House Cuckoo Clock by KooKoo delights with bright colours, guaranteed to be an eye-catcher on every wall. 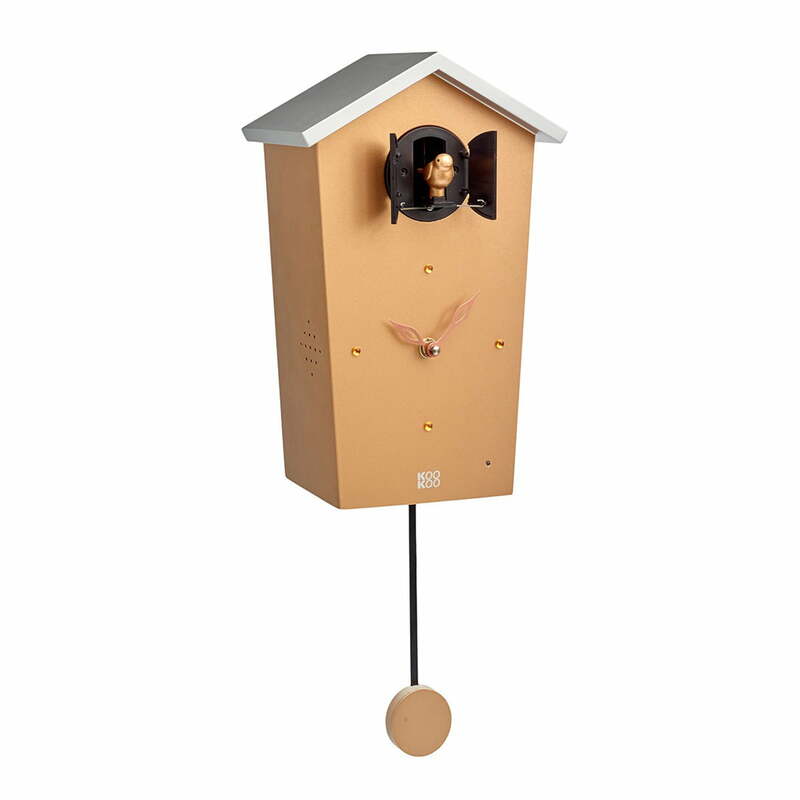 Isolated product image of the KooKoo - Bird House Cuckoo Clock. 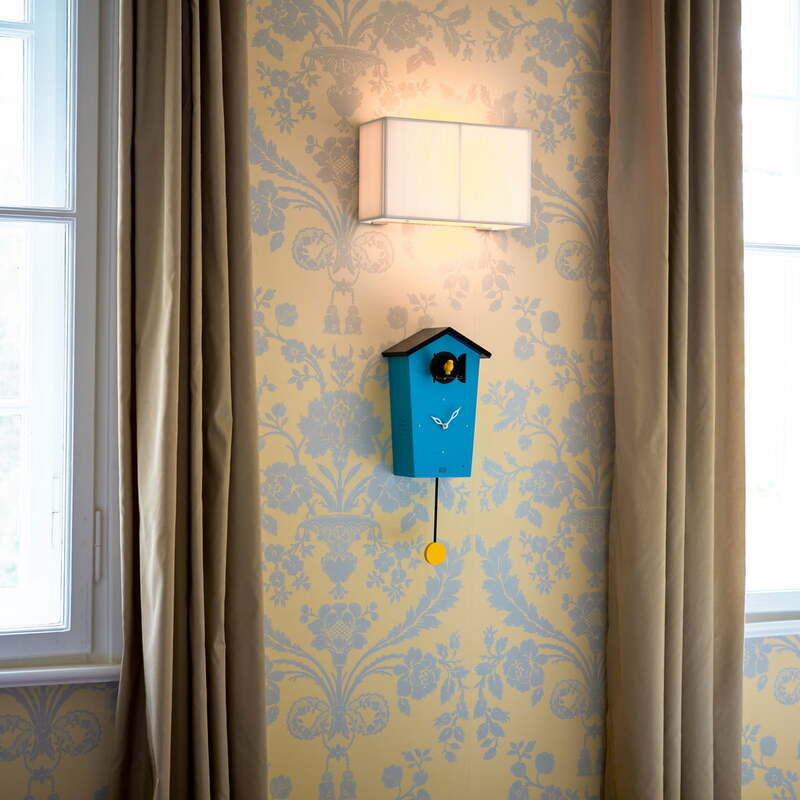 KooKoo has once again reinterpreted the classic cuckoo clock by giving it bright colours.